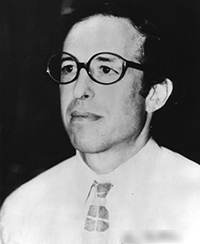 Ben R. Mottelson was awarded the Nobel Prize in Physics in 1975, alongside Aage N. Bohr and James Rainwater "for the discovery of the connection between collective motion and particle motion in atomic nuclei and the development of the theory of the structure of the atomic nucleus based on this connection." His work on asymmetrical shapes of atomic nuclei changed our understanding of the structures of subatomic particles in all elements. He has held positions at Harvard University, the Institute for Theoretical Physics in Copenhagen, CERN, the Nordic Institute for Theoretical Atomic Physics, and University of California, Berkeley. July 9, 1926Birth, Chicago (Ill.). 1947Obtained BSc degree, Purdue University, West Lafayette (Ind.). 1950Awarded Sheldon Travelling Fellowship, Harvard University. 1950Obtained PhD in Nuclear Physics, Harvard University, Cambridge (Mass.). 1950 – 1953Fellowship, Institute for Theoretical Physics (now called Niels Bohr Institute), Copenhagen (Denmark). 1951 – 1953Awarded 2 year Fellowship, U.S. Atomic Energy Commission. 1953Researcher, Theoretical Study Group, CERN (European Organization for Nuclear Research), Copenhagen (Denmark). 1957 – 1994Professor, Nordic Institute for Theoretical Atomic Physics (Nordisk institut for teoretisk atomfysik), Copenhagen (Denmark). 1959Visiting Professor, University of California, Berkeley, Berkeley (Calif.). 1975Awarded Nobel Prize in Physics alongside Aage N. Bohr and James Rainwater "for the discovery of the connection between collective motion and particle motion in atomic nuclei and the development of the theory of the structure of the atomic nucleus based on this connection". Shared 1975 Nobel Prize in Physics along with James Rainwater "for the discovery of the connection between collective motion and particle motion in atomic nuclei and the development of the theory of the structure of the atomic nucleus based on this connection." PhD advisor at University of Copenhagen (Københavns universitet). Advised by Mottelson, University of Copenhagen (Københavns Universitet). Shared 1975 Nobel Prize in Physics along with Aage Bohr "for the discovery of the connection between collective motion and particle motion in atomic nuclei and the development of the theory of the structure of the atomic nucleus based on this connection." PhD advisor at Harvard University, "The Ground States of Lithium 6 and Lithium 7." Received PhD (1950) and awarded Sheldon Travelling Fellowship. Aage Peterson collection of reprints and manuscripts, 1922-1976. Distinguished Speaker Session [sound recording], 1976 April 28. Oral history interview with Petr Vogel, 2002 December 16 and 2003 Janurary 16. Collective and individual-particle aspects of nuclear structure / by Aage Bohr and Ben R. Mottelson. Struktur der Atomkerne / Aage Bohr, Ben R. Mottelson ; in deutscher Sprache hrsg. von H.R. Kissener, R. Reif. Struktura atomnogo iadra / O. Bor, B. Mottelson. Topics in nuclear structure theory / [by] B.R. Mottelson. Ben R. Mottelson Nobel Prize biography. Encyclopeadia Britannica - Ben R. Mottelson, Danish Physicist.